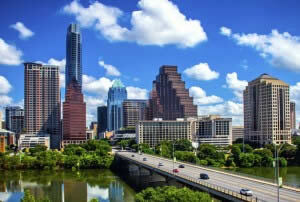 Beautiful Austin, Texas is home to the Texas State Capitol Building and a busy airport teeming with travelers. Finding your way around here can be tricky, but have no fear. You can make the whole thing much more manageable by simply making sure that you arrange your transportation to and from the airport ahead of time. The easiest way to do this is to compare all of your options and figure out whether you need an airport shuttle or a limousine or a chauffeured sedan. Think about whether you are willing share a ride, which will add on more stops on the way to your destination, or if you want to pay extra money and book a non-stop private van or SUV. There are many of options for airport transportation such as private shuttle buses including ExecuCar sedan rides for a more private and luxurious transfer. There are also taxi services that can get you to and from the airport and up to four people can ride together. SuperShuttle in Austin, TX is the quickest, easiest way for you to get an airport transfer between AUS and your hotel or the convention center. Getting a ride to the Austin Bergstrom Airport becomes easy with quality airport transportation providers like Go Airport Shuttles. You can find AUS airport shuttle providers that can take you to local hotels and convention centers at reasonable rates. Welcome to the live music capital of the world – Austin, Texas – and make sure to visit all those shows by booking our shared ride vans to get you there on time. Always available and ready to go; book our quality vans with private drivers and see the best that Austin has to offer, from the McKinney Falls to Zilker Park. We have high-end luxury cars for hire along with professional chauffeurs to get you there early and looking classier than ever. Want to go the Barton Springs Pool or Lake Austin? Look no further with our local personal drivers for hire at every major point across the city to pick you up wherever you are! Charter an SUV for your transportation needs; whether you need to go to Blanton Museum of Art or the Paramount Theater, we will get you there before anyone else does! Take your kids to the Austin Zoo or enjoy a night of amazing arts at the Hyde Park Theater with our quick and reliable taxi-for-hire service. Up the ante at the every event you attend; show up in our elegant limousines for hire in Austin with classy chauffeurs attending to you at every minute. Take a group trip to places like the Austin Aquarium; book our buses before arrival for a pleasant ride and the best travel experience in the Live Music Capital of the World. Austin is waiting for you. 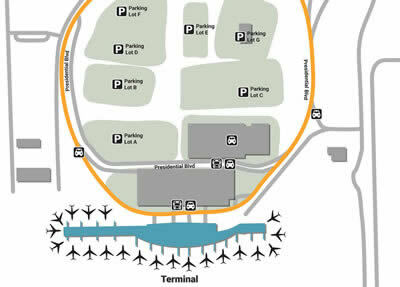 Use this airport terminal map to get from your terminal to where you need to go and save some time. For AUS airport SuperShuttle Austin reservations can include shared ride van for those who are looking for reduced costs on their rides by sharing it with other that can take you from Austin-Bergstrom International Airport to Austin Convention Center or downtown Austin. The city of Austin has a bus service that goes back and forth from the airport to the downtown area including other private transportation options. There are over a hundred daily departures for passengers who are transferred to the airport so with more and more travelers coming through Austin-Bergstrom, so the need for convenient shuttle rides or even limo and taxicab transfers on a continual basis is important due to the number of travelers landing at AUS airport. The airport is only about five miles from the central business area and nearby Austin neighborhoods of Austin and makes for a fitting location for business people to get quick and professional airport transportation for those they meet during their travel. There are flights scheduled 24 hours a day and a new facility for renting cars is under construction and will free up more space for parking as well. Over a dozen major airlines operate out of the Austin airport and many convenient check-in and parking options. Wi-Fi is available to passengers and nonstop flight services. You also have plenty of retail stores to choose from and purchase souvenirs or travel goods. Austin International Airport has a unique terminal layout with flavors of Austin and live music to give passengers the “The Live Music Capital of the World.” from local bands that play on stage. With the exception of the bus service, you can use any of the airport transportation options to take you directly to a local Austin hotel you can stay at. There is a nearby Hilton Hotel located near the airport and other close options. There are other quality hotel options near the airport like the Hampton Inn & suites, Courtyard by Marriott and Best Western Plus so travelers can pick the room of their choice. While in Austin you can try things such as a Driving Tour of the University of Texas Area and see sites that capture Austin or other colleges nearby such as Texas State University. You can also visit the Texas Governor’s Mansion, which is beautiful landmark that you will not want to miss. Traveling through Austin is simple by riding on the Capital MetroRail and Capital Metro Transit. While in Austin you can visit some local favorite favorites such as Old Pecan Street Festival and Fun Fun Fun Fest. While traveling to Austin check out what the top attractions are in this gem of a city located in Texas that’s constantly rated one of the best places to live in the US.